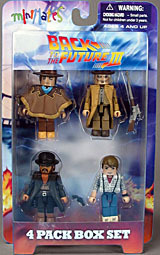 So we've looked at the Minimates from Back to the Future and from BTTF2 so now it's only fair we look at the final four-pack, the one representing BTTF3. 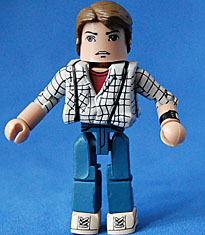 By now you've probably gathered that I am a massive fan of BttF and you also may know I'm a huge fanatic for Minimates so it can only stand to reason that I am wildly passionate about BttF Minimates, and that is ever-so-painfully true. BttF III was my favorite film of the trilogy when I was a kid, because it made Westerns accessible to my youthful mind. Of course in the intervening years I've come to accept it's the weakest of the three films, but it still holds a dear place in my heart. First up we get "Clint Eastwood" Marty. Even though it's not what he wears on the poster, this is the signature Marty from BttF III. It is the costume he wears for his most important and iconic scene in the film, and this minimate does a pretty good job of capturing it! 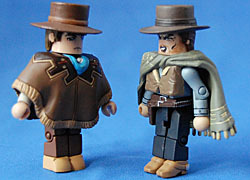 At first I thought they had reused the hat'n'hair piece and poncho from the For a Few Dollars More box set, but in fact both are unique sculpts! The pattern is sculpted into the poncho and looks great in both sculpt and paint. Sadly, Marty gets no accessories. I suppose a case could be made that that makes sense in context of the scene, but no gun and/or gunbelt seems quite an oversight. On the plus side though, underneath the poncho he has the [SPOILER] as a print on his torso - nice! Next up is Doc. Like Marty, he has several memorable outfits throughout the film but this one is his most iconic (it's his intro into the film and roughly what he's wearing on the poster). He gets a pretty good sculpt of a duster, with bits of coat poking out, and a new hairpiece with his hat. The latter rides a little high, just enough to look a little odd but not quite as distracting as with Spy Marty in the BttF II set. Also included is one of two accessories in the pack: Doc's customized sharpshooter rifle. It's a nice, all-new sculpt but feels a bit undersized. Heroes are only as good as their villains so here we get our third Tannen character: Biff's great-great-however-many-greats grandfather, Buford "Mad Dog" Tannen. 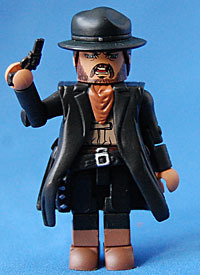 Unlike his descendants, this Tannen really does looks the part of villain and the Minimate captures it pretty well. 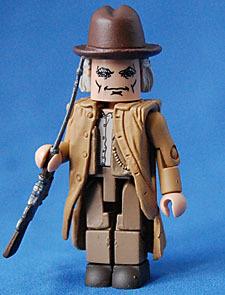 He's got a gunbelt for the handgun he comes with and a nicely done overcoat and new hat/hair piece. The gun seems like it's way too small at first but it's actually the derringer he sneaks into the party, so that's a pretty fun little detail and a welcome inclusion. The face is pretty good even though he has a "yelling" expression which seems oddly "active" for Minimates, but it works well for the character. 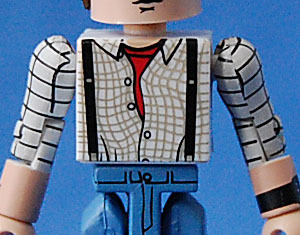 So, first off, for some weird reason they sculpted an all-new torso piece for his shirt and suspenders. This means it's just as bulky as any other jacket and in no way matches up to the version in the first boxset, which was just printed on the torso. And don't even think about pairing up these arms with that torso - the stripes are totally different in color and size. The only concievable reason of doing the figure in this version would be so that you could make T-Shirt Marty, but, of course, no alternate arms are included so yet another missed opportunity to do a more siginificant costume variation. 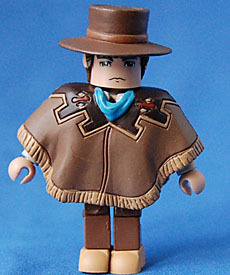 Money is clearly pretty tight on this line so it's also pretty frustrating they they blew this tooling money on a pointless torso cover when we could have gotten hat-less hair pieces or the colt gun for "Clint Eastwood" Marty. Secondly, the only time we see Marty in this outfit at the end of BttF and beginning BttF II, nowhere near BttF III and thus he has NO BUSINESS being included here. Who does? Clara f***ing Clayton!!! That's who! This is a point that is so astoundly obvious that it's nearly impossible for me to explain the fundamental ignorance that lead to it. Imagine doing a four-pack from Star Wars: Return of the Jedi and including Jedi Luke, Endor Han Solo, Darth Vader and Yavin Ceremony Luke from A New Hope. It makes no sense in any capacity and yet, that's exactly what they've done here. Aside from the obvious sexism by cutting out the female lead of the film, they also make a fully incomplete story here and missed a much-needed opportunity for non-earthtone colors. Clara's purple dress is one of the most memorable outfits in the trilogy and is even featured on the poster (that's right - unlike Biff, Lorraine or any other character Clara actually made it to a poster - character significance!). I can only assume they just cowardly figured she was only a character that appeared in one film, and it was the least popular, so what does it matter. All the more reason to get Clara out now, because once she's out then all the major boxes from that film are ticked and they can then focus on the two more popular movies. Again, BttF III suggests and provides a perfect 4-pack scenario of characters, but by leaving out one they have left the film's line woefully unfinished. DST has said many times that each boxset sold less than the one before with this one doing the worst. Well obivously it'd do the worst, it's incomplete and confusing. It takes the schizophrenia of the BttF II set and kicks it up a notch by replacing a major character with a repeat one wearing a minor costime from a different film. The low sales of this set of course led to the careless, ignorant mentality of "no one's buying the product, no one's interested" becuase, of course, the sets themselves are flawless and in no way could they have been responsible for turning potential buyers off and away. Back to the Future is a wildly popular franchise that has never had a proper toyline, and once upon a time we had a chance to get one here with Minimates but thoughtless planning led to a hodgepodge of "things from the trilogy" rather than a cohesive whole that completed the many subsets, mini-adventures and character relations throughout the trilogy leaving us with a wholly unfilfilling batch of figures. In the many years since these were originally released DST has become not only better but at times ingenious in planning out their lines so I hold up hope we'll see a return to the franchise in 2015 for its 30th anniversary with much more logical character selections and the cleverness seen in a lot of recent Minimate releases.